Château Carbonnieux is an historic estate with fine reputation. Records show that wine was first made here in the twelfth century. Later, in the eighteenth century, Benedictine monks from the Sainte-Croix abbey in Bordeaux renovated the estate and replanted the vineyards. 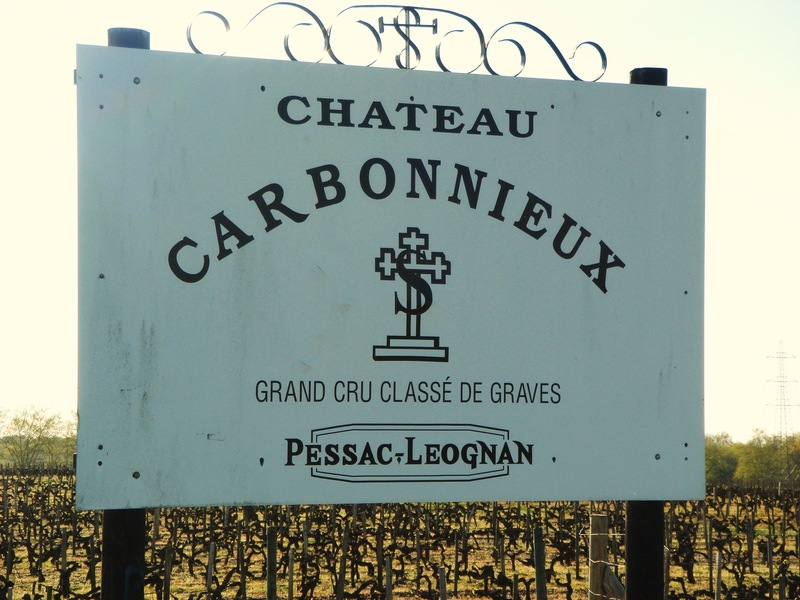 Today Château Carbonnieux is run by Eric and Philibert Perrin. Very good wines here. The whites are made in a very lean style which gain weight in bottle and the reds have increasing complexity. Vineyard/Terroir: 97 hectares, 45 hectares red and 42 hectares white grape varieties, planted on sloping deep gravel. Vineyard comprises 60% Cabernet Sauvignon, 30% Merlot, 8% Cabernet Franc and 1% Malbec for the red and 65% Sauvignon Blanc, 34% Sémillon and 1% Muscadelle for the white. Winemaking/Elévage: The red has 15-18 months barrel age, one third of which is new oak and the white, which is fermented in barrel, spends ten months in oak, a third of which is also new. 2012 Silver gold; attractive sheen; tight at first; lime zest; wet wool; flint and oyster shell; mid-eight palate with fresh acidity; lime and citrus notes; moreish and good effort; twist of grapefruit on the finish; overall pretty clean and pure; good length. Bring out a dozen oysters! Drink now – 2020. 92+ UGC Oct ’14 [Earlier note] Silver gold; attractive sheen; tight at first; lime zest; wet wool; flint and oyster shell; mid-weight palate with fresh acidity; lime and citrus notes; moreish and good effort; twist of grapefruit on the finish; overall pretty clean and pure; good length. Bring out a dozen oysters! Drink now – 2020. 91+ Tasted Jan ’15 [Earlier note] Very pale straw/green; round nose, candy notes and some honey; quite elegant palate; fine and lean; pretty classic Carbonnieux. 65% Sauvignon Blanc, 35% Sémillon. 88-90 Tasted Monday April 8, 2013 at Chateau Olivier. 2009 Pale straw/green; some wax and wet wool; bit closed; waxy palate; quite broad but currently a little dumb. Carbonnieux white often a bit backward and sullen but tends to age well. Should be good 88-90?/100 [Earlier] Very pale; apples; fresh; more weight on the palate; some waxy Semillon tones and again good freshness and some acid to balance. This could be good. 88+/100 Tasted 31st March 2010 UGC Primeurs tasting. 2012 Mid depth; earthy purple; blueberry aromatics with some soft plum; some earth; mid-weight palate with pronounced freshness [acidity]; blackcurrants, blueberries and plum notes; some texture on the mid-palate; nicely managed in the cellar. Elegant and a certain modesty. [60% Cabernet Sauvignon, 35% Merlot, 5% Cabernet Franc 13.5% alc]. Drink 2016-2022. 88 UGC Oct ’14 [Earlier note] Mid depth; earthy purple; blueberry aromatics with some soft plum; some earth; mid-weight palate with pronounced freshness [acidity]; blackcurrants, blueberries and plum notes; some texture on the mid-palate; nicely managed. Elegant and a certain modesty. [60% Cabernet Sauvignon, 35% Merlot, 5% Cabernet Franc 13.5% alc]. Drink 2016-2022. 88+ Tasted Jan ’15 [Earlier note] Deep and saturated; ripe and lush nose; pretty fruits; real sense of lushness; palate good entry; ripe; black fruits again, plums, spices; little chewy tannin at the back but good depth. Goodish effort. 5% Cabernet Franc, 35% Merlot, 60% Cabernet Sauvignon 87-89+ UGC Weds April 10, 2013. 2009 Deep and dark at centre; ripe red fruits, some leaf and blackcurrants; attractive; easy palate; ripe, stone fruits and blackcurrants; lots of material and some chew. Very good effort. Drink now – 2025 90+ MW Institute Nov ’13 [Earlier note] Deeper than the Bouscaut, quite tight to the rim; nice ripe creamy nose; ripe fruit aromas; polished; palate intense, some wood tannin here, will soften up. Very complete and satisfying. Lots of fruit and well done in a structured style. 90/100 Tasted 31st March 2010 UGC Primeurs tasting. 2007 Mid red; some depth; some red fruits and tannin on the nose; mid weight palate; OK some acid and depth. Lacks some mid-palate richness here. Fresh and good acids however. 85/100 Oct ’09 UGC London tasting.